At first they only asked for land sufficient for a wigwam; now, nothing will satisfy them but the whole of our hunting grounds from the rising to the setting sun. Listen to the voice of duty, of honor, of nature and of your endangered country. Let us form one body, one heart, and defend to the last warrior our country, our homes, our liberty, and the graves of our fathers. Tecumseh (March 1768 – 5 October 1813), was a celebrated Native American Shawnee warrior and chief. He was known as a strong and eloquent orator and promoter of tribal unity, who led his people to make significant sacrifices in their attempts to repel the Americans from Native American lands. 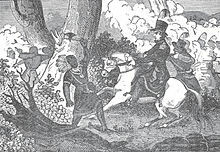 Tecumseh and his confederacy fought the United States during Tecumseh's War, at the Battle of Tippecanoe, and as allies with Great Britain, in the War of 1812. He envisioned the establishment of an independent Native American nation east of the Mississippi River under British protection. Since his death Tecumseh has become an iconic folk hero in American, Indigenous, and Canadian history. The whites have driven us from the sea to the lakes. We can go no further... unless every tribe unanimously combines to give a check to the ambition and avarice of the whites they will soon conquer us apart and disunited and we will be driven from our native country and scattered as autumn leaves before the wind. The white men aren't friends to the Indians... At first they only asked for land sufficient for a wigwam; now, nothing will satisfy them but the whole of our hunting grounds from the rising to the setting sun. I found some extraordinary characters. 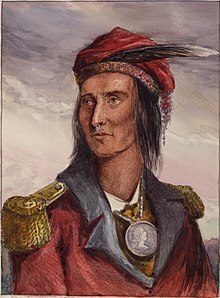 He who attracted most my attention was a Shawnee chief, Tecumseh, brother to the Prophet, who for the last two years has carried on contrary to our remonstrances an active warfare against the United States. A more sagacious or more gallant warrior does not, I believe, exist. He was the admiration of every one who conversed with him. It is difficult to feel greatness after a lapse of 200 years, but Tecumseh truly seems admirable. He was noble in his speech and behavior, adamant in his opposition to U.S. expansion, farsighted in his policies, brave in battle, yet merciful and protective toward captives. If it were not for the vicinity of the United States, he would perhaps be the founder of an empire that would rival in glory Mexico or Peru. No difficulties deter him. For four years he has been in constant motion. You see him today on the Wabash, and in a short time hear of him on the shores of Lake Erie or Michigan, or on the banks of the Mississippi, and wherever he goes he makes an impression favorable to his purpose.